This is a guest article by Bruna Costa. 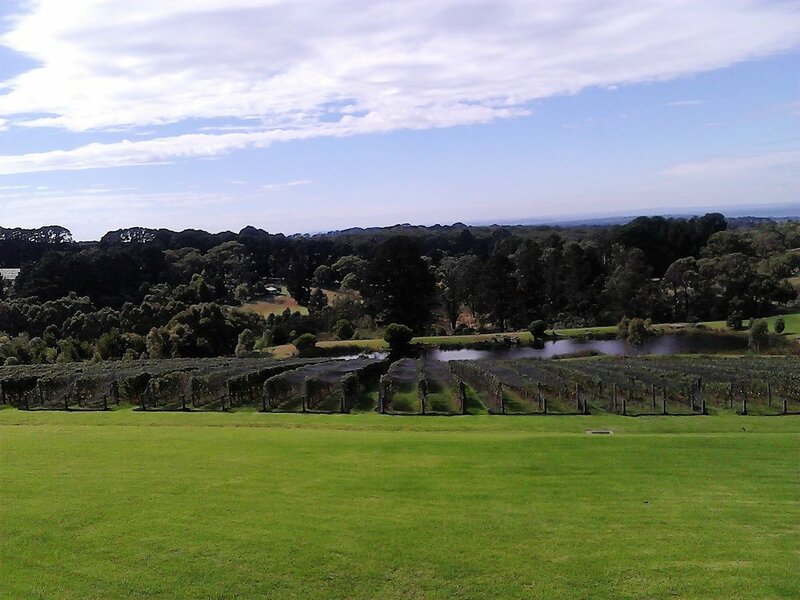 Earlier this year, I spent a weekend on the Mornington Peninsula with my sisters. During our stay, we celebrated an 80th birthday by taking a tour of the wineries in Red Hill. I had never toured the region before, and what came as a complete surprise to me was the vegetation that lined the streets. Bushland on the peninsula's coast consists mainly of shrubs and kilometre upon kilometre of moonah trees (Melaleuca lanceolata) with vines stretching from one to the other and creeping up their stringy bark trunks. Together, they form barriers between the waterfront campsites and Point Nepean Road. Their canopies shade tents and caravans from the hot summer sun. They are found along side streets and in the gardens of holiday houses. To me, moonah trees symbolise relaxing beach holidays on the peninsula. Driving away from the low-lying beachfront and up through Red Hill, I was astounded to find vegetation vastly different from that which grows on the coast. It was more like the typical Australian bush I might stroll through in central Victoria, or in the eastern region of our state. Eucalyptus trees shade the streets that meander from one winery to another. Corridors of these trees serve as borders between each winery, creating the impression that these boundaries are there to protect the secrets and individuality of the wineries. We visited one large establishment before our tour guide took us to explore some smaller wineries. Putting aside the broad boundaries of eucalyptus forests, the rolling hills of Red Hill, their small plots of vines and the occasional olive grove dotted here and there, came as a reminder to me of vineyards and small farms in the hilly outskirts of villages in Northern Italy; picturesque places I once visited. The idyllic winery where we stopped for lunch also bore a strong connection to Italy. According to the waiter at the wine tasting counter, the winery’s founder, who migrated from Italy at the age of 25, turned to his childhood interest after working in the concreting business in Melbourne for 50 years. At the age of 70, he looked for some land on which to plant the vines of his choice, and the slopes of Red Hill offered the perfect location. The abandoned apple orchard he purchased reminded him of his family’s vineyards, where he had worked as a young man, and he proceeded to plant his vines by hand down the idyllic sloping hills. He also added an olive grove to his proposed winery. We tasted several samples of his fine wines before being ushered outside to our table situated beneath shady parasols. Pergolas draped with grapevines surrounded the piazza, their leaves already displaying autumnal colours. Basking in this welcoming ambience, we dined at an artisan table crafted from a slice of a long tree trunk. Before us, rows of netted grapevines disappeared down the hillside. While waiting for our lunch to be served, we revelled in the great Australian outdoors with a touch of European ambience, right here in our own region of Red Hill. The meal consisted of antipasto served with polenta triangles, a dish synonymous to what is served in the Veneto and Friuli regions of far north-eastern Italy. We then devoured delicious pizza, washing it down with a fine Pinot Noir and water. To add to the wonderful atmosphere, welcome swallows swept across the grassland and over the vines. After our midday sojourn, we continued our tour and visited two more wineries. All the cellar doors we visited had welcoming waiters eager to tell the story of their winery's origins with enthusiasm and pride: how their family businesses began and developed, and how the whole family contributes, be it working on the land, in production or designing the business labels. Browsing from one winery to another, sitting on rustic tables under shady trees with greenery all around, is a splendid way of enjoying a lazy day, refuelling the mind and the spirit. 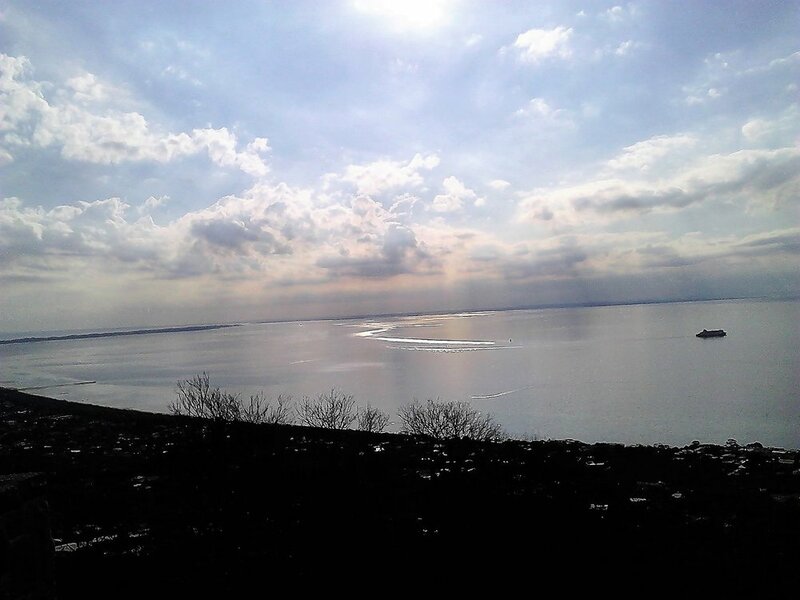 Of course, tasting the enormous variety of wines in such pleasing scenery and open spaces, and sharing the experience with others, also lightens our hearts. Adding a touch of magic to our tour was the warm sunshine which bore down on us all day, heralding the beginning of autumn. On our descent from Red Hill, we stopped at a lookout not far from Arthur’s Seat. 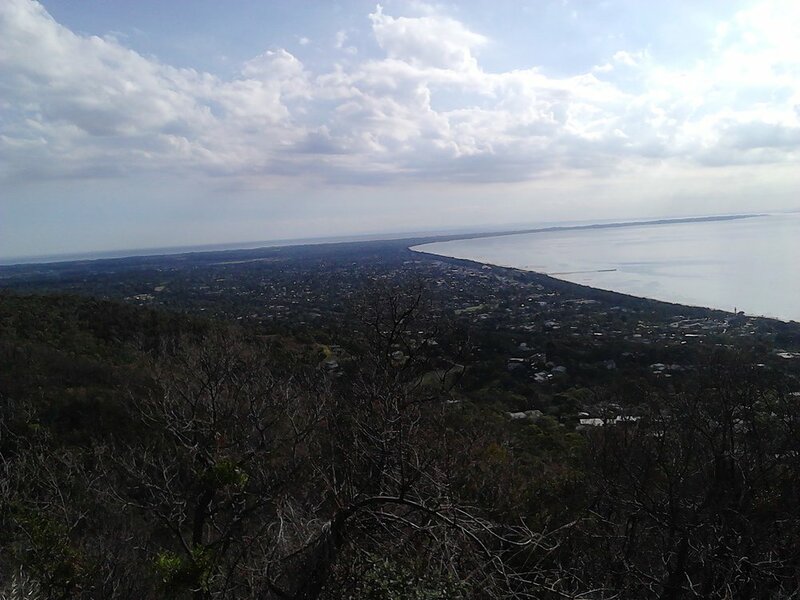 Overlooking Port Phillip Bay, the view was spectacular. On such a clear day we could see Melbourne’s skyscrapers across the bay, albeit diminished in size. A few tiny fishing boats floated on the calm sea, and a silver streak streamed behind the Spirit of Tasmania as she cruised towards Station Pier. I couldn’t help wondering where the dolphins might have been at that moment, and how many other species of fish may have been swimming aimlessly beneath that calm surface. We learned from our tour guide that it takes more than 700 grapes to make a bottle of wine, 50 wineries operate and thrive in the Red Hill region, and the ‘Eagle’ – the new chairlift at Arthur’s Seat – takes 15 minutes to descend to the bottom of the hill. Later that afternoon, while a light dinner was being prepared, some of us took a stroll down to the beach. We returned to find the soft glow of candles both inside the house and on the patio. We had brought bags of candles with us, planning to participate in Earth Hour that evening from 8.30pm to 9.30pm. This year marked the 10th anniversary of the inception of Earth Hour in Sydney in 2007. According to the Earth Hour Melbourne website, 2.2 million individuals and in excess of 2,000 businesses turned their lights off for an hour in that first year. The aim of the exercise was to take a stand against climate change. Ten years on, Earth Hour has become a global movement with more than 50 million people across 35 countries taking part. It is rewarding to participate in a silent movement which sends such a powerful message, and we intend to take part in it again next year. Of course, our Earth Hour didn’t last one hour. We sat for several hours in the ethereal light, enjoying the art of uninterrupted conversation; a perfect ending to a great day. Please note: This article is an honest review and has not been sponsored in any way by the wineries or chairlift company.